In the year 2195 the Earth has been invaded by an alien force called the Jovian Lizards. On the planet Mars, which has been colonised by human beings, its orbit it has become a frontline for a battle fought by humans and the Jovian Lizards. It’s quite clear that the United Earth Government are losing this battle. In a last ditch attempt, the Earth defence forces crash their ship into one of the enemy’s motherships, known as a chulip which crashes to the surface, wiping out some the colonist’s settlements. On Mars below in one of the colonies shelters, we meet one of the locals, Tenkawa Akito. After the shelter is attacked by the invaders, Akito tries to save people but is confronted by an army of their robots and is about to be killed. He screams and lights fills the shelter. Akito soon finds himself on Earth and can’t remember how he got there. He manages to get work on Earth as a cook but due to his panic attacks anytime the Jovians attack and fact he has a nano controller on his hand (so he can control machines), he is fired from his job because his employer doesn’t want his customers thinking he’s sheltering a deserter from the defence force. He soon bumps into Yurika Misumaru, a childhood friend from Mars, who is now the captain of the Nadesico, the most advanced space battleship ever made. The ship was made by a private company called Nergal. Due to fact the United Earth Government was incompetent in repelling the invaders, Nergal has built a ship to defend Earth and Mars. Yurika asks if they have meet before, but Akito doesn’t recognise her at first, but remembers her after finding a photo Yurika accidentally leaves of them together as children. He follows her to the ship where he is caught by security, who decide to employ him as part of the ship’s crew as a cook. The overall recruitment of the crew of the Nadesico is rather questionable. The crew aren't exactly people you could rely on to save the Earth. While the captain neglects her duties and is more interested in chasing Akito, and Akito himself is more interested in cooking than Yurika or piloting the Astevalis (Nergal’s robots) in battle. Yurika also has to deal with the communications officer, Megumi Reinard, a former voice actor and rival for Akito’s affections. Other oddballs include the main pilot, Jiro Yamada (who likes to call himself Gai Daigoji) who is a big fan of the 1970’s anime “Gekiganger III”, and even shouts out names of attacks from the shows whilst in battle. The other pilots are just as weird. Hikaru Amano is a doujinshi artist and Izumi Maki is the rather strange fourth pilot who makes the worst puns known to humankind. We also have Seiya Uribatake, the main mechanic on board, a model making otaku. Ruri Hoshino, the 11 year old computer expert seems to be the only sane one amongst them. She thinks the whole crew are a bunch of idiots. The ship is soon attacked by the Jovian Lizards, and Akito, still disturbed by the Jovians, attempts to escape using one of the robots aboard the ship. Akito ends up fighting off the invaders and manages to win the battle. Much to his disappointment, his display of his skills as a robot pilot have unintentionally made him a candidate to be the second Astevalis pilot on the ship (mostly due to the fact the main pilot, Jiro Yamada, has broken his leg). The Nadesico has yet another battlefront on its hands with the United Earth Government (UEG) who is a little miffed that Nergal wants to use the Nadesico to protect Mars, not Earth. Despite a rather desperate ploy by the UEG, Yurika’s father, Admiral Kouichiro Misumaru, who pleads with his daughter to hand over the ship, Yurika refuses to hand over the ship. Eventually negations with the UEG come to nothing and the Nadesico forces its way outside the atmosphere and onwards to Mars. Fighting off the Jovian Lizards all the way, it soon becomes apparent on Mars that Nergal is only there to acquire the Joavian’s Boson Jump technology, which can warp machines and people to any point in the universe. Worse is the fact the crew of the Nadesico later stumble upon the reality of what the Jovian Lizards actually are, and the fact the UEG has hidden this from the population for decades. I first came across this show in 1997 or so via some of the first VHS fansubs I acquired. Looking through my collection of Animage and Newtype magazines during that period, I can see it was certainly a fan favourite and hyped up massively. I can clearly recall how excited I was for this show. Some 20 years on and the truth is the show has not aged all that well. While it is at it’s core a sci-fi show, it’s almost always played as a comedy, and a screwball one at that. Most the time it focuses on Akito as well as Yurika and their love/hate relationship, which for the most part doesn’t progress one iota during the entire TV series. Akito is surrounded by women, most of who seem to be after him. To a large degree it’s like “Tenchi Muyo!” with a larger focus on sci-fi elements. Luckily as the show progresses, most of the extended cast receive a fair amount of attention especially fan favourite Ruri Hoshino. However most of the cast are reduced to catchphrases or repeated actions, and seem fairly shallow and usually don’t receive much development at all throughout the series. There are exceptions; for example Ruri’s backstory is explored in great detail in an episode almost exclusively dedicated to her. But most of the cast remain clichés with catchphrases or overused traits. In particular the character Inez Fressange is annoyingly reduced to “the character that explains everything” which becomes really grating rather quickly. Frustratingly the series loves to take the mickey out of anime clichés, but then hypocritically trots out a different set of clichés at a rapid rate. Amongst the slapstick and silliness is a rather good sci-fi plot involving the alien invaders, the Jovian Lizards, and the technology they use to teleport (known as a Boson Jump) themselves and their war machines. In addition to this is a really interesting sub plot involving a conspiracy by the Earth government hiding the true nature of the Jovians and Nergal and the government racing each other to reverse engineer the Jovian’s Boson Jump technology. Unfortunately few episodes in the series actually deal with many of these interesting sub plots. Even when a shocking plot point or twist is revealed, several episodes follow which are nothing more than pointless screwball comedies, as if the previous events almost never happened. As I mentioned previously, the one thing that “Nadesico” does exceptionally well is parody. There are loads of anime references including the anime show that the crew watch, “Gekiganger III”, which is a parody of Go Nagai robot shows like “Mazinger Z” and “Getter Robo” mixed in with a few elements of other 1970’s action anime. Often what happens in “Gekiganger III” is mirrored in the lives of the crew. One episode seems to satirise the “Miss Macross” episode of the original “Macross” TV series and the five female assistants to the main chef look very similar to the Hummingbirds, an idol group from an obscure mid 1990’s OVA series called "Idol Defence Force Hummingbird". Other anime fandom activities referenced include cosplay, garage and plastic model kit making, doujinshi. The character Megumi Reinard is an obvious nod to Megumi Hayashibara, even referencing her qualification in nursing which was gained before becoming a voice actor. Amusingly Hayashibara makes a couple of guest voice appearances in the “Nadesico” movie. Despite all these fan friendly references, fans themselves also cop a bit of criticism. Hikaru’s rejection of Seiya’s romantic advances being the most blatant example. The show also breaks the fourth wall regularly with digs at the animation production and the characters, mostly with Ruri, directly addressing the audience. The mecha design is particularly good, but the stand out element here is Keiji Goto’s character designs (based upon Kia Asamiya’s originals). While Goto’s character designs were ubiquitous in the late 1990’s, I think in hindsight they were really good and have stood the test of time. The music, both background and main theme songs, are also a highlight of the show and are very much of that period in the 1990's where a lot of anime related music was really well produced and had very high production values. Of note is the humorous character song sung by the robot pilots called “The Astevalis March” which appears as an insert song in one episode. 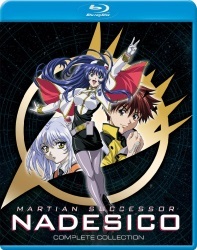 This blu-ray set, like the previously released DVD set, contains the movie “Nadesico: The Prince of Darkness” and the preceding “Gekiganger III” OVA. The movie is far superior in both animation and plot compared to the TV series, however it still contains a fair wack of the same brand of comedy seen in the TV series. The OVA for most part rehashes the animation used in the TV series, however the second half is an original “Gekiganger III” story. The OVA is bookended with new animation following the Nadesico crew as they watch the “Gekiganger III” in a cinema. Unlike the movie and TV series, the video source for the OVA is an old analogue video master. Extras on this version include the “Welcome to Belle Equipe” pre-broadcast video that was previously available only on VHS in Japan, and the similar “Nadesico Sorekara”, released prior to the movies which the original VHS came with a movie ticket. This release also includes the Japanese voice actor introductions found on the original laserdisc releases of the TV series. TV adverts for CD and video releases are also included. The back of this blu-ray release states it contains clean opening closings as well as music video, however they don’t appear on the discs (unless they’re referring to the clean opening/music video which appears in “Welcome to Belle Equipe”, which looks shoddy due to the analogue composite video source). In conclusion, this is a series which probably hasn’t stood the test of time, however the movie version is pretty spectacular and the series itself is pretty entertaining. It’s easy to see why Ruri is such a fan favourite too. The overall plot is really intriguing, but honestly a lot of writing isn’t particularly good and I’d really wished that the drama had been the focus of the show, not the screwball comedy. I was going to give it .5 less, but on balance (and because I’m feeling slightly generous) I’ll give “Nadesico” 7 out of 10. Remaining Backlog: 15 TV series, 5 OVAs and 12 movies. In addition I am also waiting for additional parts of four TV series to be released before viewing them.